Did you Know the Apple Store offers classes for school age kids? One day as I was browsing through my Instagram and Facebook feed I saw one of my friends had pictures of a coding class her 13 year old son was taking at the Apple Store. I was very interested in this for my own 13 year old son who seems to be interested in this topic I know nothing about. I asked my friend for more details and she told me it was easy to set up for her homeschool group. 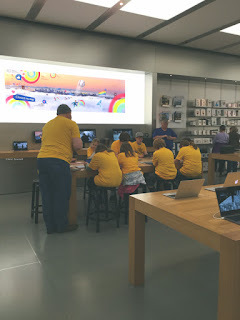 After looking through the website she provided me I saw that Apple does offer a variety of classes for school aged children ranging from ages 5-16 and even classes offered to Teachers too. My son's school is a K-12 charter school in which a few days out of the year the kids have the day off of school called Field Study Day. Field Study Days are not a free day to sleep in the kids are supposed to do an educational activity or volunteer within the community. They even have to do preliminary research and get the activity approved by the teacher prior to the Field Study date. After the activity the kids have to write up a report and present it the following week in their class. 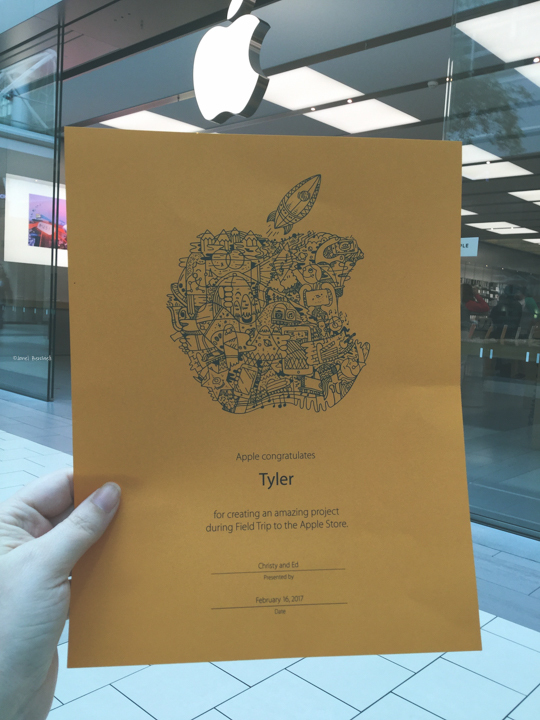 The idea of a coding class at the Apple Store was just the perfect Field Study activity. At first I wasn't sure if I would be allowed to set it up since it asked for school information and I am not a teacher at a school. 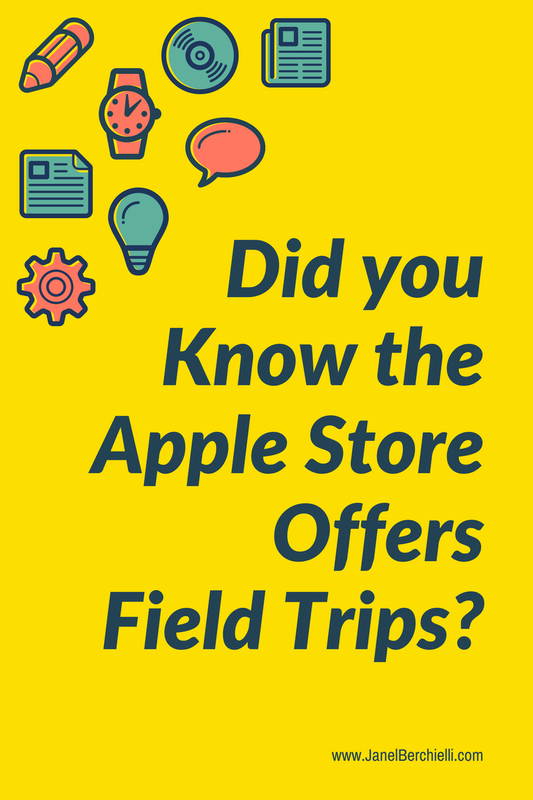 You go to the Apple Website and select the store and follow the prompts to select for your group. In the comments I wrote about the cirumstances of Field Study Day and that I was a Parent Volunteer. I actually requested the date 2 months prior to make sure I got the specific date the kids were out of school. My local store contacted me by phone and email within a few short days for us to go over the details and select the class that best fit our needs. The whole process was very easy to set up. I selected the coding and programing a robot class. I requested the activity be for children ages 8-14 years old. Upon arrival our group checked in and we were taken into the Apple Store before the general public. I had selected 10am start time, but was offered an earlier time if I didn't want the general public to be in the room too. They had two areas set up for the students and we didn't have any trouble with the general public being there at the same time. 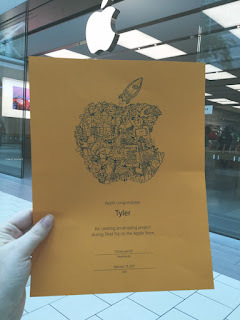 Every student received a very nice yellow shirt with a very cool and creative Apple Logo design on the shirt. The kids were so excited they immediately put on their shirts. We had 20 kids sign up with me previously and the kids were split into 2 groups. Each group had a coding activity with an Apple Employee leading it in two areas of the store. After about 30-45 minutes the groups switched places so everyone did both activities. 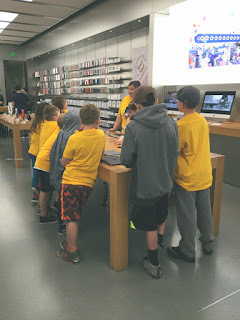 As per the requirements of the Apple Store Parents/Guardians were required to stay in the store for the entire time of the activity. I had previously made sure all Parents knew this and most of the Parents even helped the kids during the activities too. 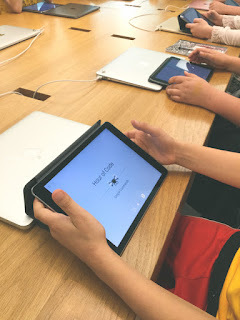 iPads were available for each student to use provided by Apple Store. Using the program Swift Playgrounds app the students learned about coding using simple commands. In the program they would use codes like move forward, turn left, etc to move their animated character through a simple puzzle maze. The app is a free download if you have your own iPad at home. iPads and these little robots called Sphero were provided in the next activity. Students were paired into groups of two for this activity. 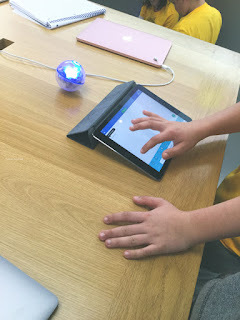 With the program called SPRK Lightning Lab on the iPad the students used coding to move the Sphero forward, change colors, and move in different directions. This activity while fun at some points the kids got carried away and had their robot go out of the taped off area. At the end of our class each student was given a certificate of completion with their name printed on it. I am very impressed with this field trip activity. The employees were very knowledgeable about the programs and did a fantastic job with the students. I would certainly suggest this activity to other school groups too. The best part was the class was entirely free and the kids gained new skills in the short 90 minutes we were there. Even the parents learned something new, I thought coding was way above my head but I came home and downloaded the Swift Playground app and had fun learning how to program too! If you found this field trip information helpful please share it with your friends on Facebook.